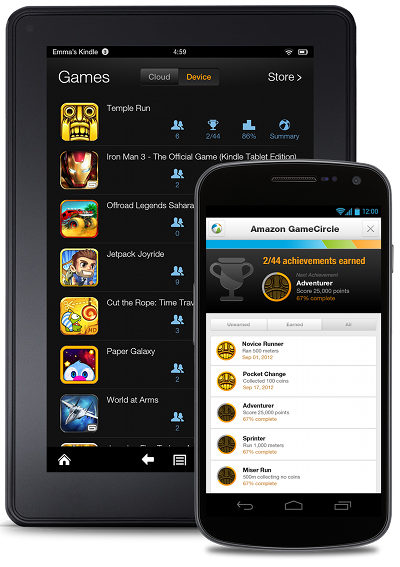 Amazon’s GameCircle, released to match the likes of Apple’s GameCenter, allows players to track achievements, see themselves on leaderboards and sync their game data in the cloud. Since its release, only specific Kindle devices could take advantage of GameCircle – starting today, that all changes as Amazon now allows any Android app to have GameCircle built into it by the app’s developers. Update: Amazon reached out to clarify that developers can use the GameCircle SDK to incorprotate these features into apps found on Google Play. That’s a big plus for users. As you could imagine, this feature is available to apps only inside Amazon’s Appstore and you won’t be seeing this through Google Play. Besides, with Google’s launch of Google Play Games, they finally released their own solution to the demand for a cloud-based gaming service.